Ok that is basically it. If you want to know ALL the details or how you can get involved in these posts then I really suggest you go back to the first Tuesday Stamping post. The 4 polishes for today was chosen by acidicice and to be honest, I wasn’t very hopeful of some of these. Needless to say they all surprised me in one way or another. This one was a surprise for me because I really though it would stamp quite well. Over the white you can see the colour shows up really well but it was a bit smudgy. I think the problem here was that Ruby Ruby was quite wet and when rolling to stamp it really just caused a smudge. I suspect if I waited just a few seconds longer before stamping, it would’ve turned out much better. It wasn’t as apparent on my ring finger so I didn’t think to do it with my middle finger until it was too late. On the black however, it didn’t show up well at all. You can sort of see it, but I am not sure if that is just because I know it is there. So here is my question: I did say I was going to show you my first attempt at stamping. Do you want me to try this one again? Knowing what I know now? If you want me to try again to see if I can get a better result let me know and I will add it onto next weeks post. My Findings: I really though this would be a great stamping polish. I think I can make this work (let me know if you want me to give it a another go) but it also doesn’t show up on the black. If this works on the second attempt it will be a great red for stamping over lighter colours. This little purple pleasure also surprised me. 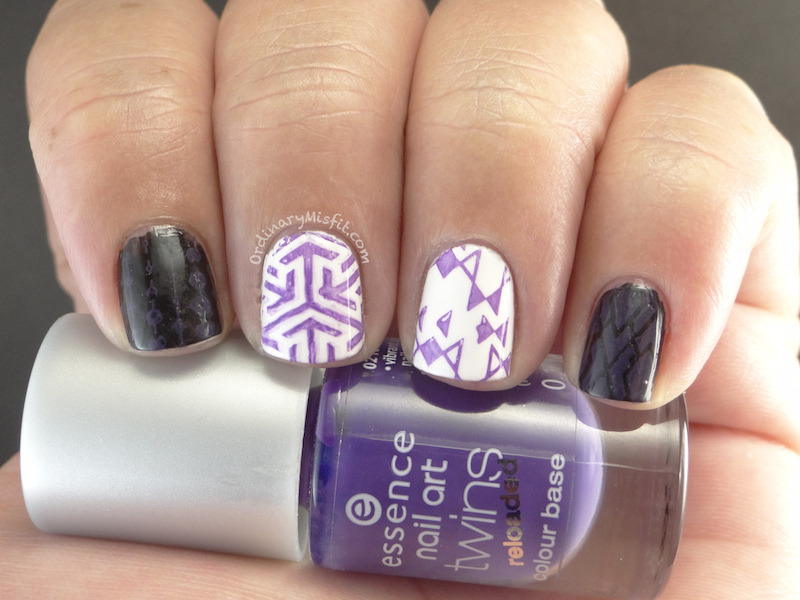 I knew it wash;t a sheer polish but I had no idea it would show up so well with stamping. You can see on my ring finger that the thinner lines are quite clear and crisp but on my middle finger it looks a little smudgy. I am not sure if it is best suited to the thinner lines or if something just went wrong with the application. On my pinky you can see a very light stamp. It doesn’t show up perfectly over the black but it is a bit better than Ruby Ruby. Those lines are also quite crisp. My index finger is the same as the pinky. It’s visible but not very. I think if you took a colour not quite as dark as black it could show up really well. Definitely one to give a try if you have it. My Findings: Romeo definitely stamps well. It doesn’t show up too well on the black but I do think it can work over some darker colours. 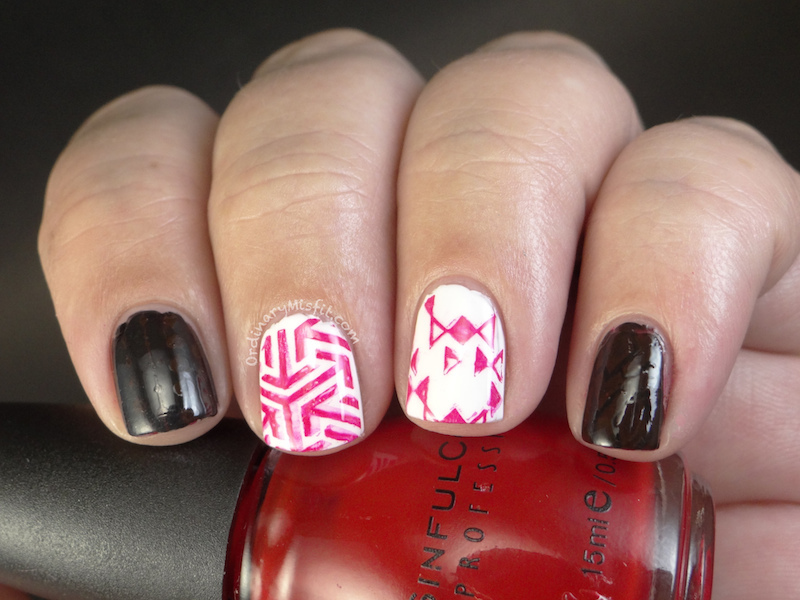 I will definitely put this on my ‘suitable for stamping’ list. This one surprised me because it looks almost better on the black than on the white. 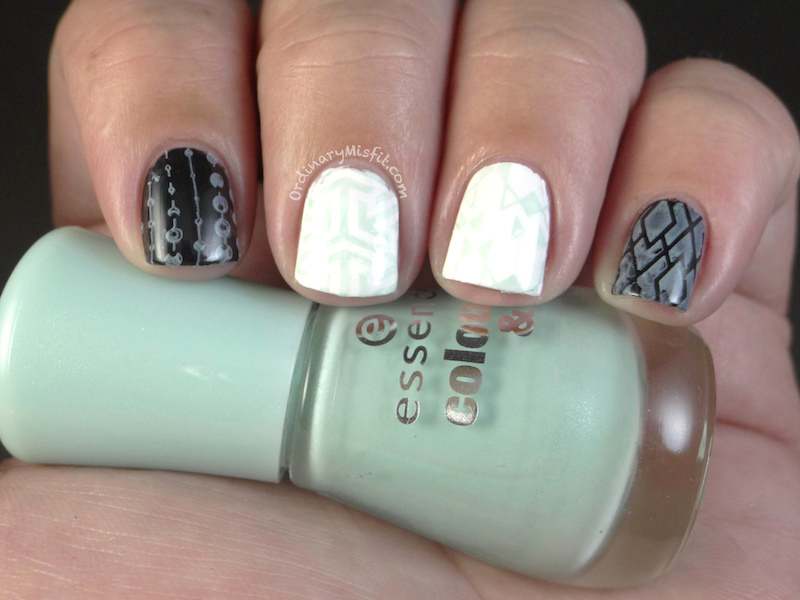 For some reason the white polish in this photo looks almost like it’s glowing and that makes the stamping seem less apparent. It is quite visible and stamps quite well on the white. The lines are nice and crisp and it transfers well. On the black you can see that That’s What I Mint shows up quite well. On my pinky it looks a bit uneven in the bigger spaces but I think if you used a thinner line it would stamp perfectly – as you can see on my index. It’s also very apparent on the photo because of how close up it is. 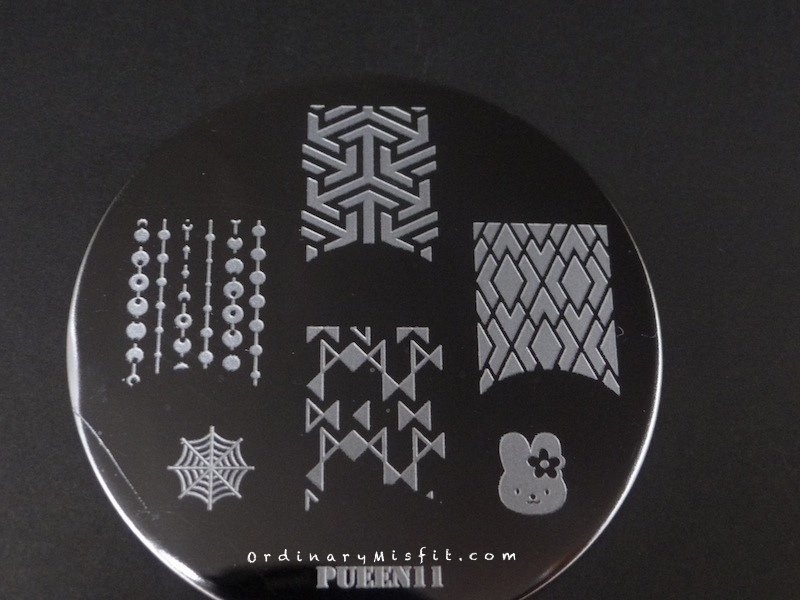 It is definitely workable for stamping and another one I would definitely recommend you try. My Findings: It is definitely workable for stamping and another one I would definitely recommend you try. Here the white polish also seems to be glowing but you can see the yellow stamping quite well. Yes I said yellow! This one was a complete mind blow for me. I did not expect Wanna Be Your Sunshine to stamp, let alone show up on either the white or the black. Instead it kinda made me squeal with happiness that a yellow can stamp well. To be honest I think this even stamps better than the yellow stamping polish I have from BornPrettyStore. Ok So even though you can’t see the white very clearly it does stamp very well. The lines are nice and crisp and the full image transfers. On my pinky it might look little patchy but the topcoat I used here bubbles like a party train so it made it look a little patchy. All in all, this was the biggest surprise for me and stamps very well. I am excited to try the other yellows now. My Findings: This is a great polish for stamping and shows up well on all colours. I almost can’t believe I am saying that about a yellow. So these are the four polishes for today. What do you think of them? Do you want to see any of them stamped over a specific colour? Do you have an idea for a stamped design you would like me to do? Do you have any suggestions for changes or additions you would prefer on these posts? I hope you enjoy these stamping posts. I am having so much fun doing them. On another note: Have you heard about the Durban Polish Party? If you are in Durban pop over here and book your seat! Wow surprised the yellow stamped as well as it did. Awesome post as always M! Thea Madness! recently posted…Water Marbling Equals HAPPY TIMES! popcorn! wahahaha. That made me laugh! Thanks T. I must say the yellow really impressed me. Thank you. 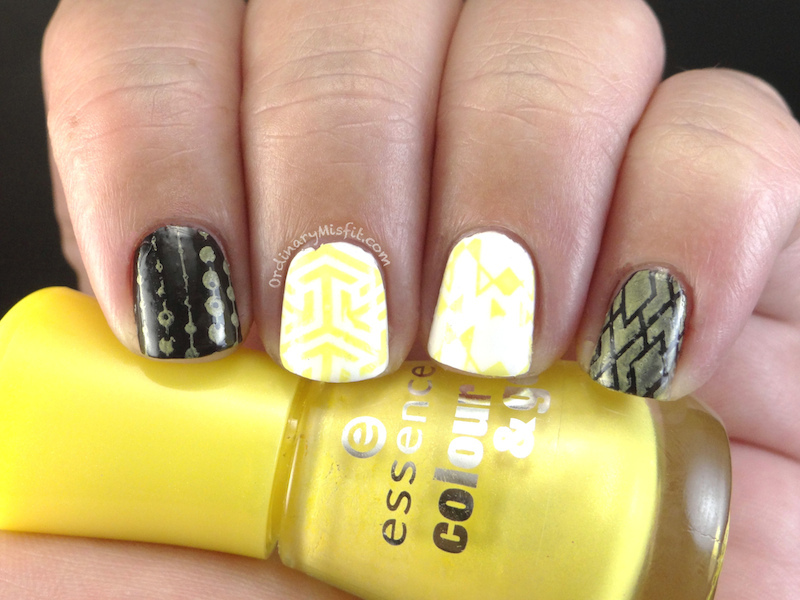 The yellow was quite a surprise as far as stamping goes.